The Fluke 2638A/05 Hydra Series III continues the Hydra Series legacy of precision, multi-channel data acquisition. The Series III improves on Hydra’s industry leading thermocouple accuracy and adds a new dimension to how you collect and view data in a portable system. The 2638A/05 is a 22 channel true differential analog input data logger with the Fluke Universal Input Connector that lets you connect and disconnect any type of input to any channel, quickly and easily. Selectable inputs include dc voltage, ac voltage, resistance, thermocouple, RTD, thermistor, frequency and dc and ac current. You can also use the 2638A/05 with optional software and other Fluke data loggers to create a flexible, customized data acquisition system. 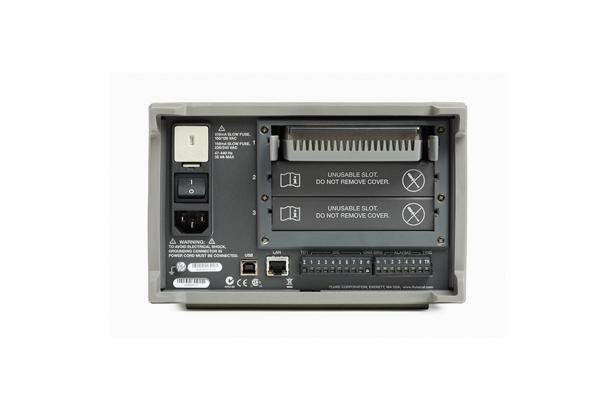 The 2638A/05 incorporates the Fluke patented Universal Input Connector to bring more accuracy to thermocouple measurements than most other instruments in its class. The Universal Input Connector supports 14 common thermocouple types. Temperature-focused menu selections make the 2638A/05 especially suitable for temperature validation applications. If you need to "zero" a large number of thermocouples to a known reference temperature before starting a temperature profiling or validation test, the 2638A/05 will normalize all readings to your reference channel at the push of a button and store the offsets for reference in a supporting data file. If you are conducting chamber tests, heat treating tests under AMS guidelines, or validating temperature devices under 21 CFR regulations, Hydra Series III makes it that much easier to comply. The Universal Input Connector plugs into the slot in the 2638A/05 that contains a serviceable relay card. The Universal Input Connector has 22 input channels (20 universal inputs and 2 dedicated, low-burden input current channels). Each input connector contains a CJC (cold-junction compensation) device, which is calibrated at the factory. The calibration date and input connector serial number are programed into the input connector and are read by the 2638A/05 when installed. This information is saved in the test setup data file, which is available for review with any associated scan data from a test setup. This feature is a valuable form of traceability if you are working in a regulated industry. Wiring a test or system setup for 20 or more channels can be time consuming. With the inexpensive plug-in Universal Input Connector, you can wire your system once, quickly disconnect the connector from your Hydra, then reconnect the Hydra to another input connector for use in a different area. Other data loggers require you to wire your inputs directly to an expensive "plug-in" active component signal conditioning module. If you need your instrument for another test at another location, you must remove your wiring or use another expensive plug-in signal conditioning module. With Hydra Series III, all your signal conditioning is inside the mainframe, not in your input connector. Using multiple low-cost Universal Input Connectors gives you the flexibility to leave your input connector at the test site, completely wired, and ready to use. When you need data from that site, simply "plug in" and load your saved setup file. It’s that simple! Never get lost again in a complex menu tree while configuring channels or setting up a test. The large, full color, thin film diode (TFD) display enables the Hydra Series III to display comprehensive easy-to-understand data and easy menu navigation. Back-lighted function keys quickly confirm the active menu selection. The "Record" key illuminates to indicate when the 2638A is recording data in scan, monitor or DMM mode. You always have visible confirmation when your data is being recorded. Copy-and-paste channel functions make repetitive channel setups a simple task. Top-of-screen menu bar headings always let you know where you are in the setup process. View your data with the push of a button. Page through all channel data and alarms in a quick view mode or scroll through channels and channel statistics individually. Statistics include rate of change, min, max, standard deviation, average, sample size and peak-to-peak information. Chart the real-time data of up to four channels at once. Simply select your channels and view real time charts of your measurements. The chart will auto scale for best fit of the displayed values. Zoom in or out to view areas of interest with the push of a button. A history mode enables you to scroll through previously collected data within the scan file…all without a PC and expensive charting programs. All displayed text in the menus and data display area are translated to eight languages. You can change the language under the instrument setup area with the push of a button. French, Spanish, Japanese, German, Korean, English, Portuguese, Chinese and Russian are all supported languages in the 2638A/05. With one key push on the front panel, you can capture the screen contents of the 2638A/05 directly to the USB drive in .jpg file format. Capture trend chart results or data displays for reports or just closer review. Each channel can be set for two alarm points: High-High, High-Low or Low-Low, in any combination. The 2638A/05 then compares the set points during each scan. An out-of-range value is reported on the main display and data files. You can also assign any alarm point to any of six TTL alarm outputs. Each channel measurement can be set to scale and record your measurement using mx+b gain and offset calculations that are available during your channel setup menu. In addition, each 2638A/05 mainframe has 20 internal math channels with alarm settings for more complex calculations that record results to your data file during each scan. Each channel result can be used as a variable in another math channel calculation. The Hydra Series III is based on a 6.5 digit (22-bit) precision digital multimeter measurement engine with exceptional measurement quality and resolution—so when you are not using your Hydra to collect multi-channel data, you can use it as a precision digital multimeter. Front-panel DMM-style input jacks and dedicated DMM menu selections enable you to measure dc voltage, dc resistance, ac voltage, ac resistance, Ohms, frequency, and temperature (thermocouples, RTDs and thermistors). Record DMM measurements to a separate DMM data file for later viewing. The 2638A/05 also displays measurement statistics and graphs measurements right on the main display. The Hydra Series III features 20 MB on-board memory for storing over 75,000 data records and configuration files. In addition to this large on-board memory, a built-in USB port is available to collect and store large files up to 32 GB directly to a USB flash drive. An on-board file management menu makes moving data files or configuration files from internal or USB memory to your PC easy. The main panel memory key opens a simple menu for managing data files and setup files. If you want to load a previously saved setup file for a test, simply select your file from either internal memory or from a USB drive and you are ready to start scanning. You can easily move stored internal data to a USB for PC analysis or move setup files to another 2638A/05. With Hydra Series III you have easy access to data without the need for a direct PC connection. To help safeguard your test data in the case of a power outage, the 2638A/05 has a menu selection to resume scanning in the same configuration immediately when power is restored. It is just another way the 2638A/05 works with and protects your data. Measurement resolution is at your control with the 2638A/05. You can choose between standard settings of Fast, Medium or Slow (4.5, 5.5, 6.5 digits) for the resolution you need. You can also select custom measurement speeds on individual channels to get the accuracy and resolution to suit your requirements. A totalizer input located on the rear panel provides a simple counter that records to the data file on every scan. The totalizer count can accumulate up to 1,048,575 counts and be reset from the front panel or remote command. Each channel’s measurement statistics can be viewed at any time. During scanning, monitoring or in DMM mode, you have rate-of-change (per minute and per second), standard deviation, minimum, maximum, peak-to-peak, and average—all available at the touch of a button. USB (virtual serial port) and LAN interface connections are available for easy connection to your company network or direct to you PC. Use optional Fluke DAQ application software for the 2638A Series or develop your own interface with the standard SCPI command set, or use our Lab View driver or Indusoft Web Studio to support your specific application needs. The Hydra Series III is the only general purpose portable data acquisition system with an IEC Category II safety rating to help protect you and your operators when making real-world measurements on machinery in industrial areas. Other data loggers that are not clearly rated for these types of category measurements should be reviewed before being used for industrial measurement. 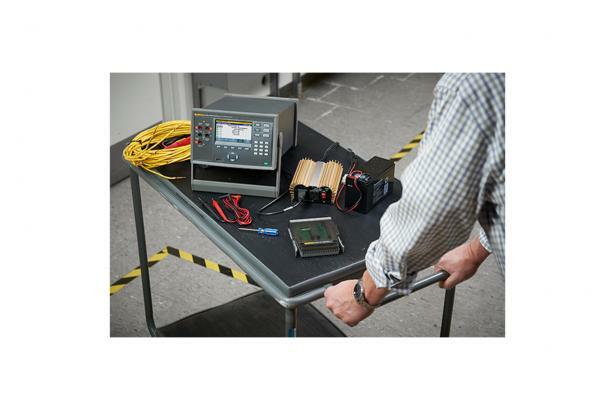 Fluke takes your safety and your measurements seriously. An instrument’s safety ratings should always be reviewed before performing any electrical measurement. Data loggers should not be an exception to that rule. It is sometimes mistakenly assumed that a high voltage input specification on a data logger makes it safe to use on or near industrial equipment or to monitor mains power. This is not always the case. The Fluke Hydra Series III was designed specifically to meet stringent CAT II safety standards. If you use your 2638A/05 in a regulated industry, you will appreciate the data traceability feature option in the instrument setup menu. This two level (administrator/ authorized user) system allows an administrator to assign up to five authorized users. The system provides an authenticated record of the operator of any recorded data. Both setup files and resulting data files contain the authorized user ID and timestamp. Guest users may use an existing secured setup file but cannot make changes, and any resulting data file carries the nontraceable label of "Guest." The 2638A/05 comes with a Fluke statement of manufacturing calibration practices. Accredited calibration certificates are available when specified at the time of order. Calibration of the 2638A/05 is straightforward and only requires a password to access the calibration menu from the front panel. 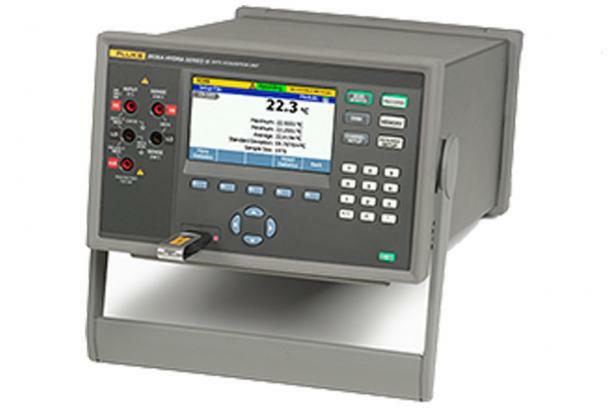 The 2638A/05 can be calibrated manually following the internal menu or by using automated procedures with Fluke Calibration MET/CAL® Calibration Management Software. The key to the isolation and accuracy of the 2638A in part comes from the use of high-quality switching relays inside the unit. Because these relays do deteriorate with extended use, the 2638A has a maximum relay counter for each installed relay board. This will assist a user in anticipating when replacing the relay board may be advisable. Need a large system data collection network? No problem! Need a 200 or 2,000 channel system? Optional Fluke DAQ application software (2680A-APSW) makes it easy to seamlessly collect data from multiple channels and mainframes. If you want to build your own system, use our LabView drivers available on the NI developers’ web site. To create a customized, graphical process-and-communication- interface with Fluke data acquisition products. Thermal validation software from TQSolutions supports the Fluke 2638A for enhanced data collection and reporting required in regulated industries. TQSoft assists with compliance with the United States Food and Drug Administration 21 CFR Part 11 regulations on electronic records and signatures for incubation, sterilization, freezing, drying and temperature mapping validation applications in pharmaceutical and biomedical industries. It also assists with compliance to European standards for sterilization, decontamination, and disinfecting (EN554, EN285, EN15883, HTM2010, HTM2030), ISO 15833 requirements for washer-disinfectors, and ISO 17025 competence requirements for testing and calibration laboratories. The TQSoft application has been audited by major pharmaceutical companies and its quality documentation has passed FDA audits. TQAero assists with compliance to National Aerospace and Defense Contractors Accreditation Program (NADCAP) and SAE International AMS 2750 guidelines covering industrial heat treating applications in aerospace and transportation industries. It supports heat treatment processes validation by Temperature Uniformity Survey (TUS) and System Accuracy Test (SAT) procedures required by AMS 2750.